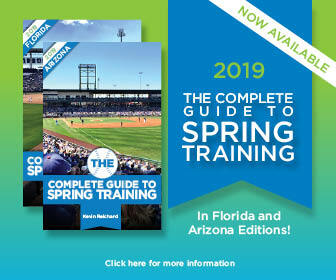 We’ve posted the Baltimore Orioles 2019 spring schedule, as the team preps for another Grapefruit League training camp at Ed Smith Stadium in Sarasota, Florida. The Baltimore Orioles caught some grief for opposing a Washington Nationals exhibition game at the U.S. Naval Academy this year, but a new spring-training relationship announced between the O’s and the Navy should get the MLB back in everyone’s good graces. It is always a pleasure to take in a Baltimore Orioles spring training game. This year’s visit to Ed Smith Stadium was no exception, as the team and its fans have settled into a familiar, satisfying routine. As you plan your Florida or Arizona trip, there are some spring training 2018 ballpark changes on tap. Most are of the minor variety, but they are still worth mentioning here. Something to mark on the calendar: the Baltimore Orioles are hosting the annual Sarasota Springfest at Ed Smith Stadium on Saturday, February 17, to mark the beginning of spring training in the city. We’ve posted the 2018 Baltimore Orioles spring training broadcast schedule, with 13 games scheduled to be broadcast on 105.7 The Fan (WJZ-FM), the flagship station of the Orioles Radio Network. If you’re heading Sarasota and Baltimore Orioles spring-training games, you’re in luck, as some Ed Smith Stadium upgrades are in the works for February and March. We’ve posted the home Baltimore Orioles 2018 spring schedule, as the team prepares for another training camp at Ed Smith Stadium in Sarasota, Florida. The Baltimore Orioles are heralding the beginning of spring training with the Sarasota SpringFest, a free family-friendly event for fans of all ages at Ed Smith Stadium on Saturday, February 18.